The best time to order is during your In-School Order Day. A representative will be on site to answer any questions. Ordering early ensures all items desired for graduation will be available. To order your cap and gown, please complete the order form below and turn it in at your in-school order day on Nov. 28th. Your height determines the length of the gown and your weight determines the fullness. Height is measured in feet & inches, weight in pounds. Please, provide measurements as accurately as possible to ensure proper fit. A graduation ceremony essential is your school's custom announcement. The announcement is ordered and given to anyone attending your graduation ceremony. 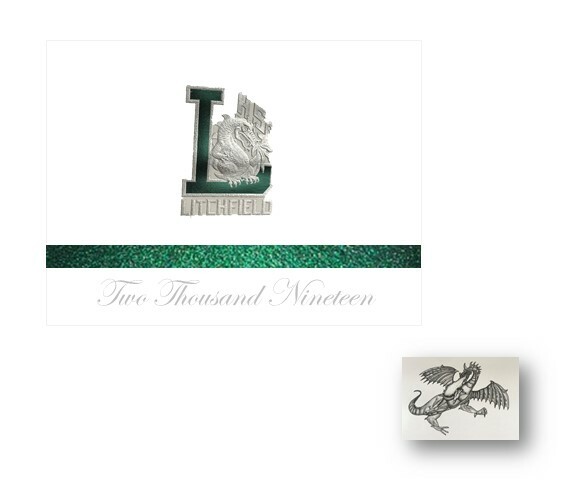 It features the Litchfield school symbol, silver embossing, green foil accents, custom milled paper and a dragon etching on the inside. Celebrate your senior year! Order Class of 2019 Senior gear and Litchfield Class of 2019 gear. Personalize apparel and gear with countless icons or add your name. No minimums required!